You've found the perfect pup and have brought her home. She's seven to twelve weeks old. The first week is a period of adjustment for all of the family members, mostly pup. Lots of love, consistency, and patience are called for. Give the pup time to explore her new world but also start teaching her right from wrong. If she starts chewing on something she's not supposed to (like your favorite hunting boots), tell her "No" firmly and give her something else to chew on. If she piddles on the floor, and you catch her in the act, firmly say "No, OUTSIDE," and take her out. If you don't catch her in the act she won't know what she is being punished for. If you want to her relieve herself in the same area take her there and tell her 'stool' or 'potty' or 'hurry up' or whatever command you prefer. Realize that a young pup doesn't have much bladder control, so don't fly off the handle and smack the pup hard for something she doesn't understand or can't control yet. Walk her often and every time she wakes up. Walk her a half an hour after she eats. Pick up all food and water by 6:00 p.m. and walk her before you go to bed. Don't expect her to hold her bladder for 7-8 hours. She can't and it's not healthy for her kidneys or bladder. Have her crate placed in an area that is readily accessible to her. Put her in the crate with the command, "Kennel." Leave her in the crate for a little while at a time. Give her a bone or chew toy to keep her occupied. Expect her to cry at first, but if it gets excessive, tell her "Quiet" or "No noise." Almost NEVER let pup out of the crate when she's crying. That will only teach her that crying means I can get out! The exception is when she has been crated for a long time and needs to relieve herself. If at night - take her out, praise her for a job well done, and put her back in the crate without a lot of fuss. Keep the pup in the crate when you are not home. At night it sometimes helps to put an old wind-up ticking clock next to the crate with her. The ticking simulates a heart-beat. Another trick is to put one of your worn shirts in with her. It has your scent and can soothe her. Most dogs won't soil their sleeping place but again, realize that pups don't have their bladder and bowels under control. If she continually cries, take her outside and see if she has to relieve herself. When she goes, heap lots of praise on her and put her right back into the crate. Don't play with her, just say "Kennel" and I use "Bedtime" so they learn that it's time to sleep. Eventually she will come to accept the crate as her home and safe place and will even go into it during the day to rest. The most important things to remember with puppy training is to keep the lessons very short, use a lot of positive reinforcement, and always end the lesson on a happy note. Don't punish the pup for not obeying a command until you are positive that she knows what you want. Never hit the pup in the face. I put nylon, buckle-type, collars on my pups right away so that they get used to it being around their neck. Buy a light weight six-foot lead to go with it. The sooner they get used to walking on a leash, the better off you'll be. Don't try and enforce any kind of heeling right now, just get the pup used to the restrictions the leash has. Let her drag the leash around loose. Most pups will jump and buck like a bronco when you first attach the lead to the collar. Ever so patiently kneel down and call the pup to you. She'll be confused but will look to you for comfort. Don't yank on the leash but use gentle pressure and lots of praise. Talk to the pup constantly telling her what a good girl she is as she follows you on the leash. Using food as rewards is an easy way to get the pup started. Sit. You can start your pup on simple commands almost immediately. When you are petting her gently push down on her rump and say, "Sit." Praise her and say, "Good sit." Do this often but don't expect her to grasp the meaning for about a week. When you feed her, tell her to sit, push her rump down and praise her. Make her sit for about one second and put the food down. When you go to the door to take her out, tell her to sit, push her rump down and praise her before opening the door. Using a clicker is an easier way to teach pup. There are tons of articles on clicker training on the internet and an entire chapter devoted to the basics in my book, Retriever Training for Spaniels. Stay. Once she understands "Sit", start teaching pup to stay seated. Instead of using the word, "Stay" you can simply delay the treat or release for a few seconds more. Eventually, pup will sit and stay for a full minute. This takes a lot of time and patience so don't expect miracles. When you put her food down or take her out, command to sit ("Good sit"), and stay. If she moves, use that universal puppy sound "Aaaa!" that means "Wrong move, kid," put her right back where she was supposed to be and repeat the commands. Be patient and only expect her to hold the stay for no more than 5 seconds. Heap tons of praise on her and let her out or feed her. Here. One of the most important commands other than "NO" you teach your new puppy is "HERE." I prefer "Here" to "Come" since you can put more inflection in your voice with "Here." It is also close to "Heel" which comes a little later. When you call your pup to you and she doesn't respond, go to her and gently pull under her chin towards you saying "Here." Praise her lavishly when she listens. Do not go out and yell at her or she'll be confused and run away. Put the leash on her if she won't listen and gently pull her to you while saying "Here." If she runs the other direction, tell her "No" firmly and repeat the "Here" command. Repeat the leash or under the chin steps above if she still ignores you. Keep in mind that pups are very curious and get side-tracked easily. If she is vigorously sniffing something, she may not hear you (or at least pretends not to.) In that case, clap you hands, call her name and say, "Here" again. If she still won't respond, go to her, get her attention and gently pull her to you as you back up, praising and repeating the "Here" command. Once you know she understands what "Here" means, then you can use a smack on the rump if she doesn't listen. If she runs away, get the leash on her and gently pull her towards you, commanding "Here" as you pull. Praise her when she responds. The clicker/and or treats works well for Here. Each time pup comes when she's called, treat her. Also, get in the habit of calling pup in, treating her, and letting her run off again. If you call her in and put her up in her kennel or crate every time - well, would you come in knowing the fun was over? Whistles. I start all my puppies right off with a whistle with the commands. When you call your pup in also whistle. Most people use a trilling three notes for the come-in command. When you tell her to "Sit" blow the whistle once. I don't always have my whistles when I am just out walking so the pups also learn to come in when I whistle with my mouth. I try and duplicate the same sound the store-bought whistle makes. Biting. All puppies love to bite. The only problem is, it hurts! When playing with pup and she bites, firmly grab her muzzle closed and say, "No bite." It will take awhile for this command to find it's way through because puppies naturally bite when they play. Be consistent, but again, don't hit the pup in the face. You can smack her on the rump if she doesn't listen, but make sure she knows why she is being punished. Stand. One last simple command that is optional for field dogs, but mandatory for show dogs is "Stand." It doesn't hurt to train your pup this. 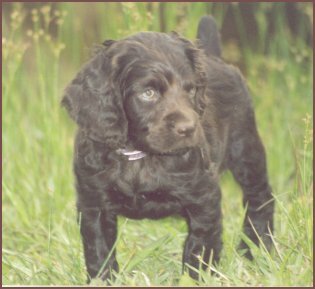 You may someday want to work your Boykin Spaniel in the obedience or conformation ring. It also helps at the veterinary office during examinations. Put the pup on a table. She won't like it and will probably cower down. Place your hand under her hind legs where your fingers touch her belly and say, "Stand." Be infinately patient since she is frightened of the height and the new environment. Continue to talk soothingly to her and lift her up so that she stands. Repeat the command and praise her if she stays standing. This only takes about two to three minutes at most. When she'll stand for a few seconds, let her down. Once she has learned the "Stand" command, stand her up and have someone 'examine' her. She will most likely lean back to try and avoid contact or jump up to lick the face of her examiner. Put her back in the pose and have your assistant check her teeth, run their hands over her legs and back. When she moves, put her back in place. Tell her how great she is. Every chance you get, have strangers examine her while she stands still. Most of us use our Boykin Spaniels as hunting dogs. It is never too soon to introduce pup to retrieving. Take an old white sock and tie knots in both ends. Another choice is a paint roller brush that makes a great small bumper. You can even cut it in half if it is too long for the pup. Take pup to a hallway and kneel down with her. Tease her with the sock and drag it in circles around her. Toss the sock a few feet and call her name (or use the command, "Back" if you prefer.) If she goes right out after it and picks it up, great! Praise, praise, praise, and call her in to you. She is limited where she can go so she should come back towards you, though she will try and get around you to take her 'bird' somewhere and eat it. Retrievers naturally retrieve but we have to teach them to deliver the goods to us instead of keeping it for themselves. Grab her gently and tell her what a great little dog she is. Put your fingers over her top lip and exert gentle pressure over her teeth to open her mouth and say "Give" or "Drop" or "Leave" - whichever you want to use. Toss the sock again, this time a little further down the hall. Stop after three successful retrieves. You want to keep her begging for more. You can do this twice a day, I wouldn't recommend any more than that at first, once in the morning, and once in the evening. Before trying to move outside make sure she is completing her retrieves down the hallway perfectly each time. When you move outdoors, expect her to run off in the opposite direction with her 'trophy.' Call her to you and if she doesn't respond or drops the sock, go to her. Pick up the sock and toss it a few feet and tell her to come in. She may not listen, so tell her "No" and say "Here" again. I keep up a constant excited chatter something like this: "Fetch it up, good girl, here pup, here, good girl, no, here!, good girl" while clapping my hands. If she is looking at you with the sock in her mouth but still not coming in, start running backwards still chattering away like a lunatic. Most pups can't stand you running away and will come after you. Keep back-peddling until the pup is close enough to grab. Try and get one good, short, retrieve that she brings straight back. Don't fight her on this. If she won't come in with her bird, take her back to the hallway and reinforce the lesson. Make sure she understands the "Here" command before correcting her. Don't do anything to discourage her from retrieving. If she does the lesson well in the house, but won't listen outside, put a lightweight 25 foot rope on her collar that she can drag behind her on her retrieves. When she picks up the sock, gently pull her towards you with the rope, keeping up the chatter. Heap on the praise when she listens and comes in. You can keep the rope on the collar even when you lengthen the retrieves so that you have something to grab or step onto if she bolts. Even if you never use your Boykin for duck hunting, or for any kind of hunting for that matter, she should still be taught to swim and retrieve in the water. It is never too early to learn. In fact, the sooner, the better. 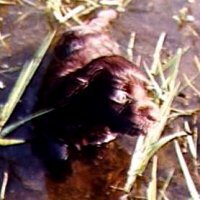 Some breeders introduce the pups to water before you buy them. I try to put the pups in water at four-weeks if the weather (and water) is warm enough. Take the pup to a shallow lake where she doesn't have to swim to get wet. Walk out in the water with the pup and don't make a big deal out of walking along the water's edge. Don't splash her, just slowly walk in. Let her sniff around and play if she likes. Encourage her to come in if she is hesitant. If she is following you in, just keep walking into deeper water until she has to swim or leave the water. Praise her when she swims but don't make her stay in the water. If she won't come in pick her up and set her down in the water up to her chest. Encourage her to come to you and "Good pup" her constantly. Take a towel with you to dry her off. If she gets cold, don't force her to re-enter the water. We want her to love the water, not to learn that it's uncomfortable. At first, make the retrieve where she doesn't have to swim, just wade. Toss it a little bit further until her front feet have to paddle a bit to reach the bird. If that works well, toss it even further (4-5 feet) until she has to swim to get it. A lot of puppies will paw the water with their front paws and "Go vertical" instead of leveling off. Don't be concerned, she will get the hang of it with enough practice. What happens is that the pup gets so excited about having something in her mouth that she 'forgets' how to swim. Once she gets more confident about retrieving, it becomes old hat and she can concentrate on using those back legs and pulling with her front legs to find the shore. I trained one Boykin pup who, at 6 weeks, loved birds. I tossed a plastic dummy in the water and she wouldn't go in after it. I tossed a whole pigeon and she went right in, dunked her head under water grabbing the bird, and turned to come in. Her front feet were paddling to beat all, but she was sinking! She wouldn't let go of the bird and I had to step into the water and support her belly to help her to shore. It didn't slow her down! I went to pigeon wings instead and she learned to level off. She was only about 4 pounds and the pigeon was one pound. I don't know if I could swim with one-fourth my body weight in my mouth. Okay, the pup is used to the collar and leash, comes (usually) when called, retrieves on land and in water, and can sit and stay for all of five seconds. Now what? Take your pup on outings. Walk in the neighborhood, out in the woods, go the flea market, to your child's soccer or softball game. Get her used to people and being petted by strangers. When you go to the woods, take off the leash and let her explore. If she roams too far, call her back in and you can add a new command, "Hunt close." Take your whistle with you and use it. When you call her in, give her the "Here" whistle. Don't over-do this, just start conditioning her to understand the whistle and the word mean the same thing. Give her plenty of headway and let her sniff and dig and play. Treat her when she comes in with a "Good here"and let her wander off again. Continue the whistle work in the yard with your regular training. Once she is retrieving, take a bird wing or training bumper with you on your outings. Give her a couple of retrieves in different cover. If she can't find the 'bird', tell her to "Hunt it up" or "Hunt dead" and encourage her to find it. Go to the area of the 'fall' and let her find the bird. I can't emphasize enough how much praise puppies need, so praise, praise, praise! When she comes back, praise her, keep walking and tell her, "Go out" as you wave your arm forward. She may go forward thinking you have thrown something for her to retrieve. If she doesn't, don't force it. Just enjoy the outing and your new companion. This command will come in handy later for upland game hunting. Remember, with all of these commands, we are not training a soldier but a young dog. Don't expect her to grasp the meaning of all these commands right away, you are conditioning her and bonding with her. Also, some dogs learn faster than others. You have to learn to 'read' your dog and advance only when she is ready. If you try and teach something she's not ready for, relax, go back to step one. Please don't compare your puppy to others. Each dog is an individual with his or her own quirks and inconsistencies. Be patient, be consistent. Have fun! copyright 1996-2003 Web Designs by P.K.